In the time it took me to finalize my affairs in Divinity’s Reach, the Pact Fleet had departed for Maguuma Jungle, the heart of the newly awakened Elder Dragon Mordremoth. As per his duty as a member of the Pact, Logan Thackery, Captain of the Seraph forces, left with them to once again carry the fight to the monster who would destroy us all. I was to follow in their wake, documenting the dragon’s advances through the jungle in hopes of capturing any signs of weakness that could be used to the Pact’s advantage. 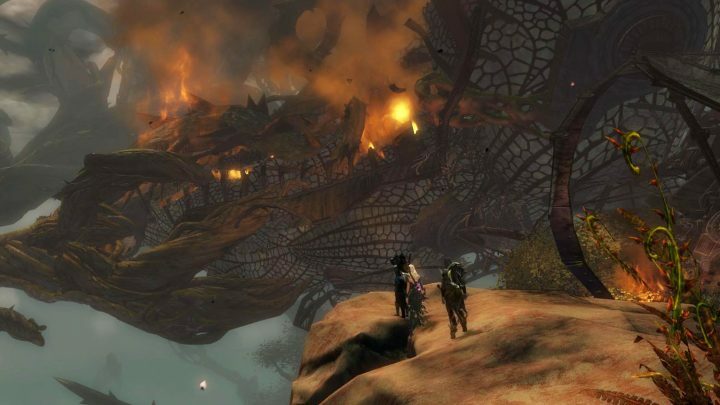 Now reports have come in this morning that the Pact Fleet has been plucked from the sky, defeated in mere minutes by the dragon’s power and, most shocking of all, betrayed by the Sylvari. This recently awakened race of plant people had seemed gentle and reliable allies, if not a little naive of the larger world around them. 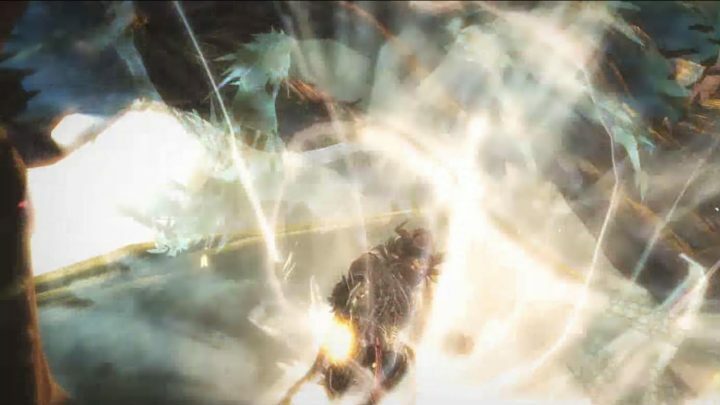 However, these supposed friends were really sleeper agents literally planted by Mordremoth, and waiting to be awakened by the Elder Dragon. With the fleet down near where my own airship was supposed to land, I am forced to disembark in the embattled Silverwastes, where the war has spilled over into the various small fortifications scattered throughout the desert wasteland. Enormous vines have erupted out of the white hot sands, breaking through rock and forming arches of green flesh that are both vegetable and animal in their nature. I report to Red Rock Bastion in the Silverwastes for a more detailed briefing on the situation. We are to head to Amber Sandfall and then into the jungle through the mountain pass. 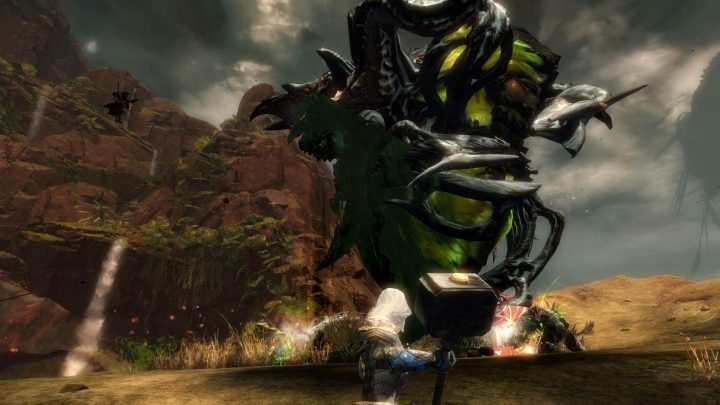 It isn’t easy as Sandfall is currently under attack from the dragon’s Mordrem army. They’ll have to be cleared out before we set up a more permanent base of attack. I stumble through strewn rocks and chunks of metal while following the path into what is supposed to be a jungle. Instead I am greeted with the sight of flaming wreckage spread far and wide over the canopy and cliff faces. This was the remains of the Pact Fleet. Here and there, survivors scurried to salvage whatever they could of the once great airships, hoping to at least use the debris to shore up defenses before sunfall. I try to search for Thackery and the others, but am quickly swept along to a meeting with Explorer Metella, Laranthir the Wild, Crusader Gatt, and several others. Metella would prefer to stay and fortify the area against further attacks, but Laranthir feels we should rescue those of the Pact forces that have been taken prisoner as we will need the manpower. 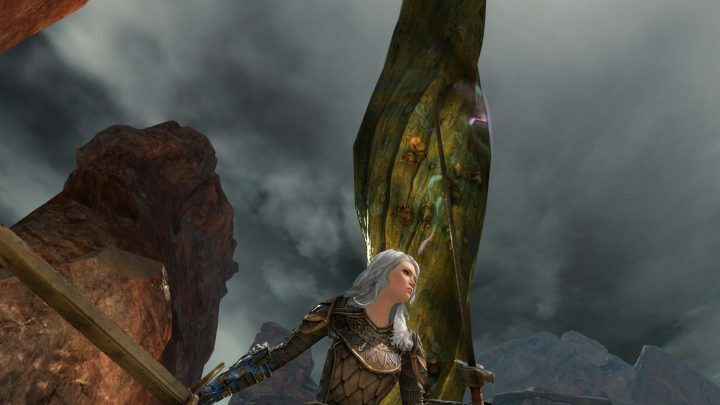 Most around me seem leery of the Sylvari, but Laranthir assures us that the more strong willed of his people were able to ignore Mordremoth’s call, as evidenced by his own willingness to aid us. I am still wary of Laranthir, but I think his plan is more strategic than Metella’s. I feel reinforced walls are useless if there is no one around to hold the fort. If an attack gets through, we’ll need the manpower to fight off the enemy as efficiently as possible. Laranthir and I begin our journey following a path down into the undergrowth of the jungle. Vines jut out of rocks wetted by a myriad of small waterfalls tumbling down from on high. In many areas, the sides of the paths drop off into sheer, bottomless ravines. One wrong step, and one could easily fall into one of these dark pits, never to be seen again. We are soon met with resistance from Jungle Tendrils and prison guards. Laranthir’s arrows keep the Mordrem at bay while I use the dwarf king Jalis Ironhammer’s strength to pound the enemy into submission. 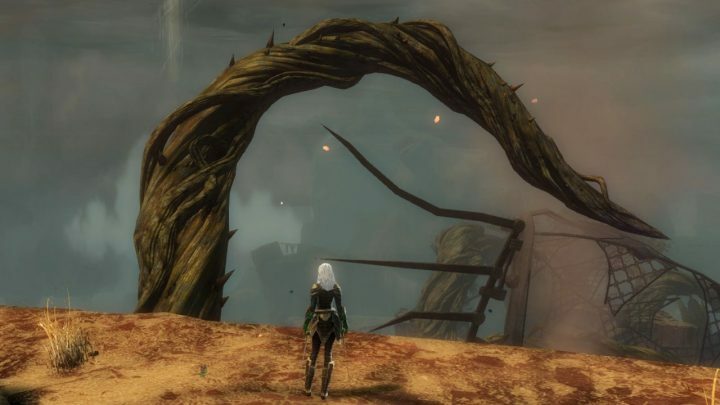 The Asura Crusader Gatt and the one-time-outlaw Sylvari Canach help free the captured Pale Reavers and we push on further into the jail to free the other prisoners. 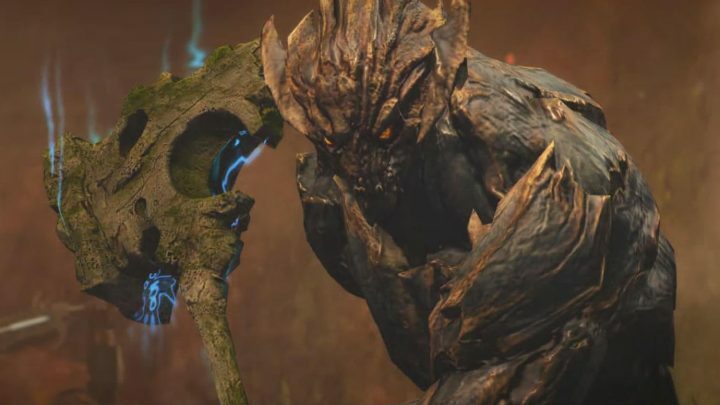 The hardest challenge comes in the form of the Mordrem Guard Overseer, sending crushing blows of energy down upon us, enraged by the defeat of its allies. Gatt grimly states that we now know where the remains of many of the Pact soldiers have gotten to, as he points to a nearby creature. As the vegetation wilted off of this creature, it became apparent that this was the reanimated corpse of one of our fellows. Fortunately I did not recognize it as any of the leaders of the Pact, but the thought of an undead Logan Thackery roaming the jungle at the behest of the Elder Dragon sent a chill through me. We return to base camp and discover Metella has had her own trouble fending off the attacks of the Mordrem. She’s disappointed that the Pact leaders, known as Destiny’s Edge, were not among the prisoners, but also optimistic that we will find them. There is little time to help with the fortifications, as the enemy sends another wave of attack against our camp. Mordrem Grunts take up the charge, and when they fail, a champion takes to the field. The Mordrem Guard Cavalier is here to retrieve the prisoners we have rescued and add our own corpses to the dragon’s horde. He is nearly impervious to our attacks while he is mounted upon a great horned beast. Then, as a new wave of grunts march upon us, the world seems to shake and a brilliant flash of light appears from behind us. The surrounding air is sucked away into what appears to be a wormhole, out of which a legend emerges: Rytlock Brimstone of Destiny’s Edge. He was last rumored to have plunged into the Mists in an effort to reobtain the legendary sword Sohothin after a failed ritual ripped it from his claws. 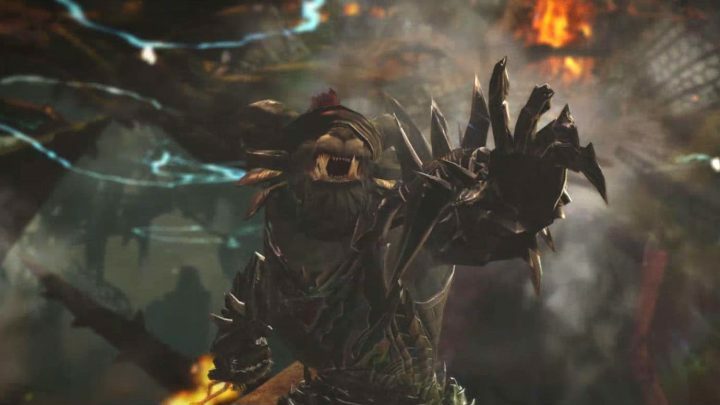 He returns now a changed charr, leaner and more agile with a blindfold stretching across his eyes to block out the distractions of the world. I know how he feels. Ever since entering the jungle, more voices have been calling to me from the Mists, joining those of Jalis Ironhammer and Ventari. These new voices are darker — and more sinister. I feel a surge of bloodlust from a human spirit originating from distant lands. Lithe and with quick reflexes, it promises me an artful victory over my enemies. A fourth voice bubbles up from the depths of my mind, but this one is even darker. I can almost feel it leering at me from the blackness, sneering with pointed teeth at the other spirits and mocking them. “If you want to defeat your enemies, you’ll have to take their power for your own,” it growls. It’s becoming almost too much to bear, and with the treacherous terrain to deal with as well as the abominations sprouting up around us, I wonder if I should be wearing a blindfold as well to focus my perception. A swell of blue power shoots out of Rytlock and takes the form a dragon soaring straight toward the Cavalier. The monster finally tumbles from its mount, landing flat on its back. It’s not down for long, and it heaves a massive two-handed ax, shimmering with dragon magic. Rytlock reacts quickly and releases Sohothin, his blade bursting into bright orange flame. The two charge each other, and I do my best to spin out of the gap between them, lest I be crushed by their magnificent power. The fight is messy and while the mount is quickly dispatched, it takes longer to whittle down the Cavalier. Afterward, I get a chance to talk to Rytlock. He agrees we must continue the search for Destiny’s Edge and wipe out the dragon’s minions wherever they are found. He tells me to continue my role as a leader, and I make the decision to break camp and begin searching the surrounding jungle for any clues to the whereabouts of Destiny’s Edge. Before I get too far from camp, I notice a small group of pocket raptors gathered around the slope of the hill and am in the middle of clearing them out when the ground once again trembles and begins to crack beneath me. The very earth grows teeth and crumbles away as a massive head breaks through to the surface and shoots upward. The writhing mass winds up being little more than a boney hinged jaw on a thick, twisting vine that extends several meters above me. Just as I get ready to attack this Mordrem Breacher, it spews a stream of green slime over the ground along with several creatures ejected from its maw. Clumsily, the grunts scurry to their feet and begin their attack on the area. Charr commanders rush into the fray and I join them in fending off the attackers and taking out the Breachers, preventing enemy reinforcements from joining the battle. Just as we finish off the last Breacher, another vine breaks through the area. This time it’s one of the greater tendrils that pulsates with glowing energy. 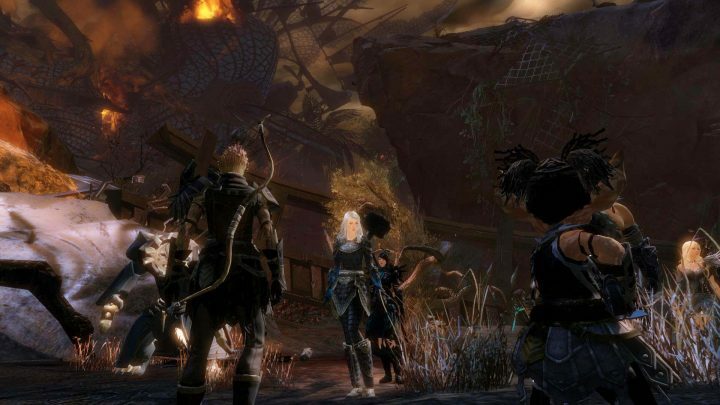 I see various Charr running around carrying explosives and rush to protect them as they setup their plan to blow up the vine. Around us, the air pulses and the ground shakes from brilliant aerial attacks launched from somewhere on high. Husks rise from the ground and try to prevent us from planting the explosives, but we are ultimately successful. The lead invasion force is finally stymied for now, so I follow a group of warriors deeper into the forest, hoping to discover some leads on the missing heroes. With the chaos of the battles cleared, I realize the persons I am following are Laranthir the Wild and Chief Aviator Skybreaker. They are making a push into the Shrouded Ruins in an effort to take the fight to the enemy, while a more firm foothold is established by the remaining Pact forces in the jungle. More heroes join us as we climb our way up the mountainside path. Mordrem Breachers literally hurl their army of warriors at us, but we are able to continue. We reach a tall staircase that doubles back on itself repeatedly up the cliff face and follow it to a landing where sniper rifles are unloaded for our use. We will make our stand here while Skybreaker plants more explosives to clear the blockage in the path ahead. The rifles are easy to manage and we quickly pick off the larger, more sluggish Mordrem troops. 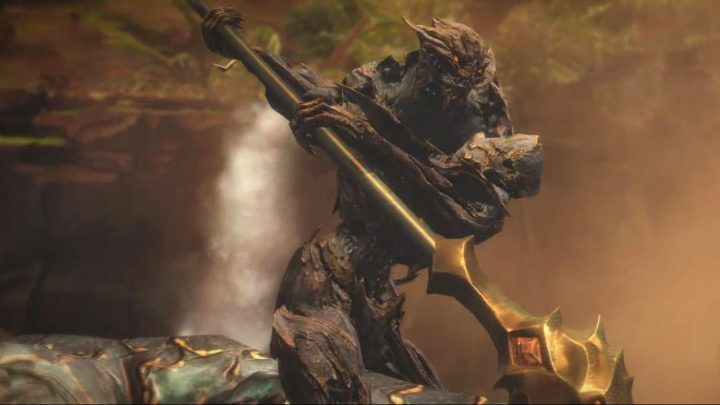 However, the Mordrem wolves are faster and quickly close the distance between us and them, forcing us to take out swords, axes, and staves to defend ourselves. With the passage finally cleared, we can make our way into the ruins that honeycomb the Dry Step Mesas. Mordrem grunts and warriors crowd the narrow paths which often jut out into sheer-sided fly buttresses, twisting above and below us in a vertical maze. 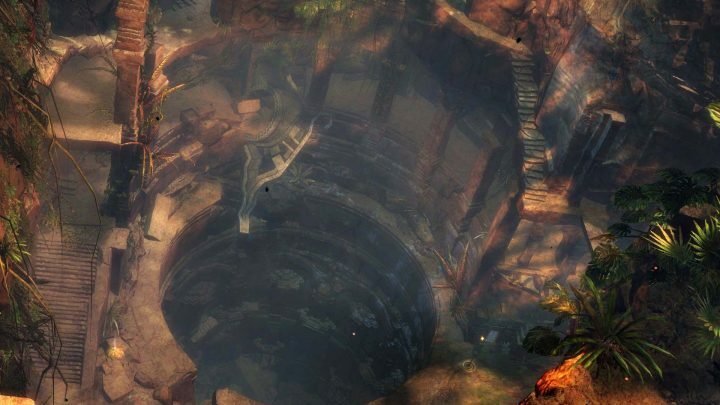 I am briefly disoriented and separated from the other heroes, but a view from a nearby ledge reveals that we have entered a series of paths that form the circumference around an enormous and very deep looking pit. I follow a narrow passage that eventually leads to another, wider ledge where everyone has congregated. To my left, I see another giant vine writhing skyward over the top of us. Arranged along the ledge is a series of mortars which we defend from attack. The assault of the Mordrem, determined not to lose any more ground, is relentless this time. I find myself dodging, weaving, and loading the mortars while our foes send out explosive blasts of their own. Looking around, I see much of our supply of rockets has come from the many fallen Pact Choppers here. Volley after volley hits the massive vine, but the Mordrem keep advancing until finally their champion arrives. As I look on, I see the ground is trembling not just from the explosions, but also from the giant Mordrem Troll headed in my direction.